Praise God, this is the fourth post in our Grace Series and it begins our discussion of grace in the life of Apostle Paul. Here’s a rundown of the previous posts in the series. The first explained the meaning of grace, in part, and stressed how it should be reflected in our relations with others. The second was a testimony of grace derived from my interactions with some believers online. In the third, we looked at the three major works of grace in the believer’s life. You may wish to click’on their titles to read these previous posts if you haven’t already seen them to get yourself up to speed before reading the present title. If asked to choose the apostle they envy his zeal and commitment to matters of the kingdom, most Christians would definitely choose Apostle Paul. Paul was so sold out to the work of God that he didn’t have a family. He explained the advantage of this in 1 Corinthians 7:32-35 as freeing the unmarried from the concerns of pleasing their spouse, and I would add family, to render undivided devotion to the Lord. Although the married have more physical responsibilities, they can still serve God acceptably if they eschew unnecessary distractions. Like Paul and the Lord Jesus before him, we can all give single-minded devotion to God by His grace. Paul, previously called Saul, was a lawyer by training, belonged to the Pharisee sect notorious for nitpicking others on matters of the Law, and was convinced the followers of Jesus were perverting the faith of their fathers. He made it his mission, with the backing of the Sanhedrin (the highest Jewish ruling body) to exterminate them within and without the borders of Israel. He entrapped and arrested them in large numbers. He also oversaw their execution, the case of Stephen being an example (Acts 7:57-60). Paul was zealous for the wrong cause. His zeal was based on ignorance of the truth. On one of his expeditions to hunt down some of the saints in foreign lands, this time in the city of Damascus, Paul had a life-changing encounter. The Lord Jesus appeared to him in blinding light and pointed out the futility of his agenda. Paradoxically, Jesus told him that in his attempts to persecute Him, Paul would only hurt himself. We remember Emperor Nero who had many Christians killed on the trumped-up charge of burning Rome. He committed suicide not long after the massacre. Countless more examples abound in history. The Lord then commissioned Paul to preach the faith he had sought to destroy. The full account can be found in Acts 9:1-19, 26:12-18. Shortly thereafter, true to his all-out style of handling whatever he believed in, Paul commenced preaching that Jesus was the Christ in Damascus to the consternation of the Jews and followers of Christ. A plan to assassinate him was hatched, the first of many in the years to come, and his ministry of suffering for the name of Christ as the Lord Jesus had confided to Ananias in Damascus (Acts 9:16) had begun. Subsequently, Paul played, presumably, the most significant role of all the apostles in spreading the gospel among the Gentiles (non-Jews) and his own people in line with the mandate given to him by the Lord (Acts 9:15). He journeyed to many lands for the cause of preaching and strengthening his converts and ended up writing most of what became the New Testament, besides the Gospels. What a glorious testimony! What an amazing work of grace! And it so turns out that it is from Paul we learn the significance, or better still indispensability, of grace in our lives as Christians. His writings were suffused with mentions of grace, each letter beginning and ending with a greeting or prayer for grace (See Romans 16: 7 & 20, Philemon 1:3 & 23). The Grace Series will continue soon with a discussion of some MANIFESTATIONS OF GRACE IN PAUL’S LIFE. Glory to God! Oh Lord, give me the grace to live in such a way that in the end, like Paul, I will be able to say, “I have finished my course. I have kept the faith.” Let it be so, dear Father, in Jesus’ name. The scriptures used in this study are from the English Standard Version of the Holy Bible. Great! Apostle suffered so much for the gospel of God. He was indeed the greatest apostle. No wonder God reserved him for a mission to the strong-hearted. Oh to have that kind of grace! But we must realize he didn't fold his hands and think the work will do itself because of grace. He moved and God glorified Himself. Indeed we as Christians have to work hard for the grace of God. Ummmm, we don't have to work for it. The Lord gives it to us free of charge. But it helps us to work for God after we have received it. Have a beautiful day, Victoria! Thanks a lot, Gloria, and all glory to God! I hope you have been well. Sending much love and hugs your way. Have a blessed 2017. Edith - I absolutely LOVE the look of your blog--but even more, I love the content! Beautiful, deep, inspirational and educational. Love it! Paul is my favorite of all the apostles. Perhaps that's because he was a bit of a talker/writer - and ended up writing most of the NT? Ha! Only by God's will! I love his heart, mostly - and his passion! This was a wonderful post. 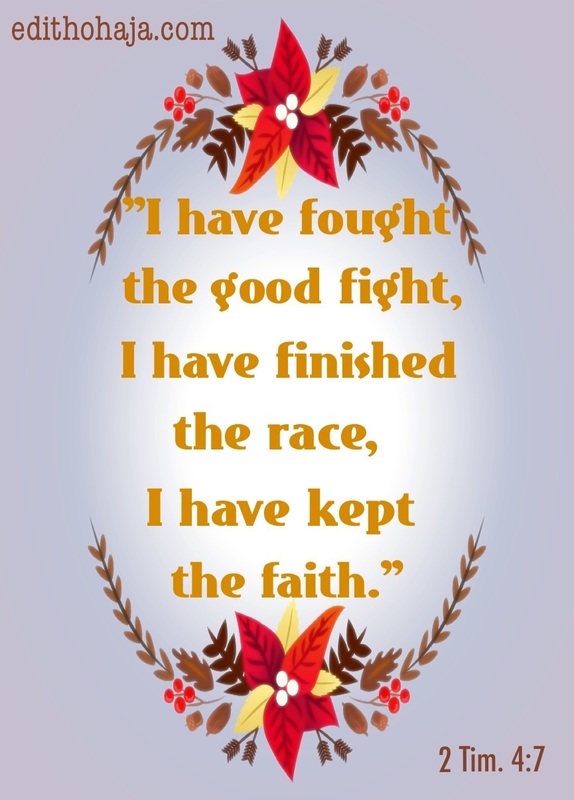 I especially love the statement on fighting against the Lord; it's a losing battle! But with Him, we win the battles, and the war! Praise God! Thanks a lot, Rebecca! I totally agree! God used Paul a great deal and I believe it was because he yielded. He served willingly and then passionately by the grace of God! Thanks for dropping by. Your page is beautiful and loaded with spiritual food too. Stay blessed in Jesus' name. Amazing post. It is great to read this inspiring post, keep writing and share with your enthusiasm. Sharing the faith is extremely important, taking example from the apostle's life. Thank you very much, Sara! I appreciate your visit. You are highly blessed in Jesus' name. Christians are hereby encouraged by this post to emulate the apostle, Paul. Remember, he was once the greatest persecutor of Christians, then turned the greatest preacher of the gospel. No matter how deep you think you've gone in sin, it's not yet late to be great in the sight of God. Remember, the gospel made us to know, through this great apostl, that repentance/salvation is free for them that live. There's no repentance in the grave. You can still be like apostle Paul. Amen. Thank you very much, Collins! You are richly blessed in Jesus' name. Glory to God! Thank you so much and stay blessed, Ebere! Amen in Jesus' name. That is a wonderful prayer. I really appreciate it. You are highly blessed in Jesus' name. Amen and amen. Kind of you to pray that, Adanna. May the Lord grant you wisdom and favour in all you do in Jesus' name. Amen. His grace is always enough for us. Thank you ma for this inspirational article... I appreciate your write up thank you Ma. I really appreciate your wonderful write ups that you are using to inspire us the youths. God bless you. Be inspired, then, my dear in Jesus' name. And the Lord bless you richly too in Jesus' name. `What an encouraging series!! Going to save this, and go back to read the first three tonight!! Awww, thank you so much! I really appreciate this. God's grace with your family and ministry in Jesus' name. Your posts are always inspirational and educative, keep it up as the good Lord continue to reward your work, more blessing I pray upon you. Meanwhile We can't do anything without his Grace; his Grace is sufficient for us. Amen and thank you so much, Onyeka! In Rev. 4-11, God says that we are created for His pleasure. Ma'am, may you fulfill His pleasure upon your life,amen. Nice prayer. Amen. Thank you very much and I pray the same for you, Joshua! Praise God and thank you, Nkemjika! Paul had a turning point and in the manner of the first Apostles who, when beckoned by Christ gave up their lifestyles to follow him. Saul too did not hesitate, and that was the beginning of the long but successful journey that saw him preach from one end to another, the life we need to emulate. I’d like to add that Christians should emulate the life of Paul if we want to get an everlasting life and enjoy the fruits of being holy before the Lord. Thank you for the advice, my dear! You are blessed! Paul suffered more than any other apostle because of how he suffered many christians, his suffering was pre-destined by God. Because of such suffering, he gained God's grace and eternal life. let us be firm in any situation we find ourself because our glory and grace lie within. Thank u Aunty Edith Ohaja. My dear J.C, you got your theology all wrong. Paul was not saved by his suffering but by the grace of our Lord Jesus Christ, referring to His dying in our place. Bless you! Amen again. Bless you, Faustina! Sometimes I ask myself, how can a man like apostle paul who was not even a believer at first achieve so much. That is what grace can do. It takes a nodody and transforms him into a celebrity. Indeed, it does! Bless you, Covenant! This is a very inspiring article ma. Paul's life and walk with God is what we christains should emulate. Yes, because he was careful to emulate Christ. A wonderful example indeed. no MAN can worship God without his GRACE,no wonder all these MEN are failing because they lacks this nutrients of Holy-Spirit.Quest for Worldly possession has consumed every body. May God deliver us in Jesus' name. What an inspiring piece! Paul was an epitome of God's grace and total submission. Well said, Chidinma! A great example to us He is! Yes, Walter, that's what grace can do! May we experience it to overflowing in Jesus' name. I lengthen the chain of concurrence. Bless you, Joy, in Jesus' name. Paul, a man with great revelations of who Christ is. Even Peter writes that Paul's letters are beyond human understanding or hard to understand (2 Peter 3:16). So happy to read this inspiring post..paul was indeed a manifestation of God's grace..bless you ma. Christians stray sometimes, but by God's grace, they trace back their steps. This write-up is one to reflect on. Truly, God's grace is needed in our life and as it was sufficient in the life of Apostle Paul, it will be sufficient for us. I always admire Paul and His ministry. Indeed He was favored by God. I do too. There's so much to learn from his life. Thanks for visiting, Jackline, and remain blessed! FATHER, THE GRACE, I CALL FOR THE GRACE TO DO THE MIND OF MY HEAVENLY FATHER. THE GRACE TO WORK IN THE RIGHT SEASON. Paul was indeed willing and passionate about the things of God and spreading of the gospel of Christ, even in suffering he did not give up, honestly this is a life of emulation. Paul did not run the race flesh and blood alone but was filled with the grace of God for the spirit might be willing but the flesh is weak but with God's grace in a man's life he will make it. my happiness is that Paul lived a fulfilled life that he was able to testify. I pray for the same grace in my life. amen and amen ma. wowww! God's grace was really evident in the life of Paul from his conversion/salvation down to his ministry of preaching the gospel and yet, i admire his courage in fulfiling this God-given ministry notwithstanding the odds against his life.it's true of Christ's saying that whosoever shall lose his life for His sake shall indeed save it. many are indeed chosen to fulfil God's ministry but only few get to actually make it to the very end. may God's grace see us through in our lives. Surely we cannot do this on our own, we need God's grace to stand the test of time. To God be the glory, his words says that his grace is sufficient for us. All we need to do is to believe his words and key into this grace. This encounter between Jesus and Paul clearly indicates that all power belongs to God. When God decides to have your time you will do things better than the best despite strength of tyranny. Paul went from demoting Christianity by killing saints of God, to promoting it by spreading the gospel beyond Jewish borders above all other apostles. Seeking the grace of God to abide with us should always be our daily prayer as christian because we can not do anything on our own even to crossing the road safely everyday. Apostle paul always pray for god's grace in his lifetime because he was constantly faced with persecution from every side and we should emulate him in that aspect. Paul was such a man whose zeal was known by his enemies to the end that it became a threat to them, the grace upon his life was extraordinary that he rose above his fellows in the ministry. Indeed paul is a great apostle of christ. Though once a sinner but now a preacher of the Gospel. Every christian should strive to be like christ, preaching the gospel to unbelievers just like paul did is our sole purpose in life as a christian.